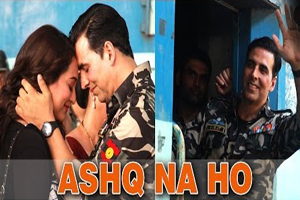 An emotional and heart touching song dedicated to soldiers in the voice of Arijit Singh featuring Akshay Kumar, Sonakshi Sinha, Sumeet Raghavan. The video of this song is available on youtube at the official channel of Zee Music Company. This video is of 3 minutes 46 seconds duration. The lyrical video of this song is also available on youtube at the official channel of Zee Music Company. This video is of 5 minutes 51 seconds duration. Lyrics of "Ashq Na Ho"
Lyrics in Hindi (Unicode) of "अश्क ना हो"